Panellist: ‘After Data Is Collected: Collaboration in Analysis, Writing, and Impact Activities’, Towards More Equitable Interdisciplinary Research Partnerships, Development Studies Association/Economic and Social Research Council Interdisciplinary Workshop Series (April 25, 2019), London, UK. Speaker: ‘Gbagba and Jaadeh! as Anti-Corruption Revolutions from ‘Below’.’ Rule of Law and Anti-Corruption Centre (ROLACC) International Anti-Corruption Masterclass 2019, Achieving Transparency – Issues in the Modern World (April 28, 2019), Doha, Qatar. 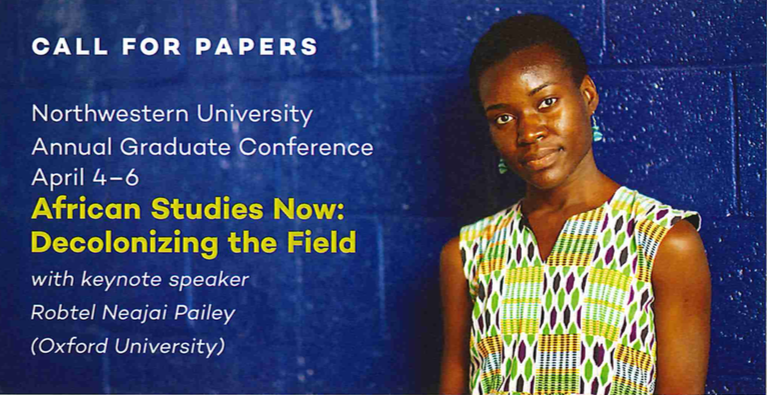 Panellist: ‘Turning Down the Heat: (Mis-) Representation of African Migration in the Media and the Role of Researchers’, 2019 European Conference on African Studies (ECAS) on Africa: Connections and Disruptions (June 13, 2019), Edinburgh, Scotland. Co-presenter: ‘Post-party Politics, Forum Shopping and Liberia’s 2017 Elections’, 2019 European Conference on African Studies (ECAS): Africa: Connections and Disruptions, Pol 14 on ‘Regime Change, Democratic Experiments and Trends in Succession Politics in Africa’ (June 14, 2019), Edinburgh, Scotland. Keynote Speaker: ‘De-centring the “White Gaze” of Development’ , Development Studies Association Annual Conference, Opening up Development (June 20, 2019), Milton Keynes, UK. Co-presenter: ‘Post-party Politics, Forum Shopping and Liberia’s 2017 Elections’, Liberian Studies Association (LSA) 51st Annual Conference (April 12, 2019), Chicago, Illinois, USA. 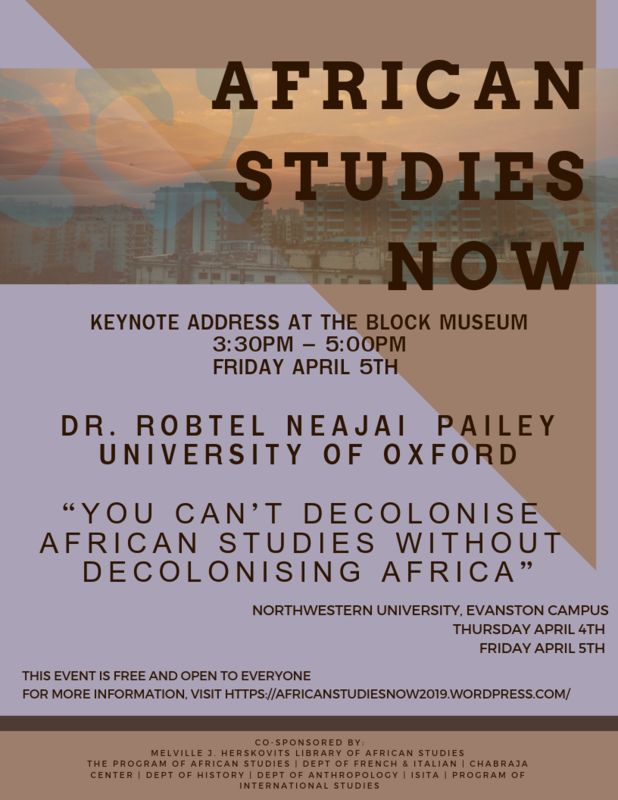 Keynote Speaker: ‘You Can’t Decolonise African Studies without Decolonising Africa’, Northwestern University African Graduate Seminar (Afrisem) International Conference on African Studies Now: Decolonising the Field (April 5, 2019), Evanston, Illinois, USA. What Is African Studies Good For? Panellist: ‘What Is African Studies Good For?’, Researching Africa Network-Northeast Roundtable (March 22, 2019), Durham, UK. 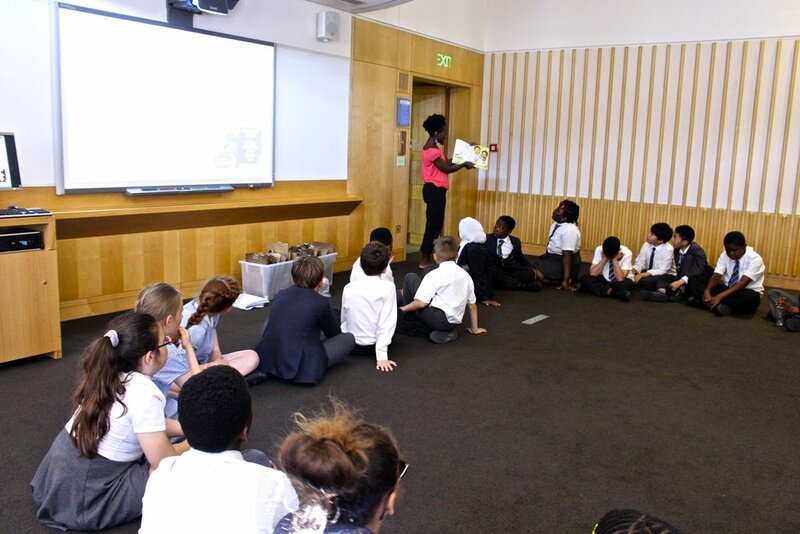 Workshop Facilitator for Primary School Pupils: ‘Gbagba and Jaadeh! : Lessons in Ethics, Integrity and Accountability.’ Escola do Futuro (March 14, 2019), São Paulo, Brazil. Presenter: ‘Women, Equality, and Citizenship in Contemporary Africa’, University of São Paulo Institute of International Relations Post-Graduate Seminar (March 12, 2019), São Paulo, Brazil. 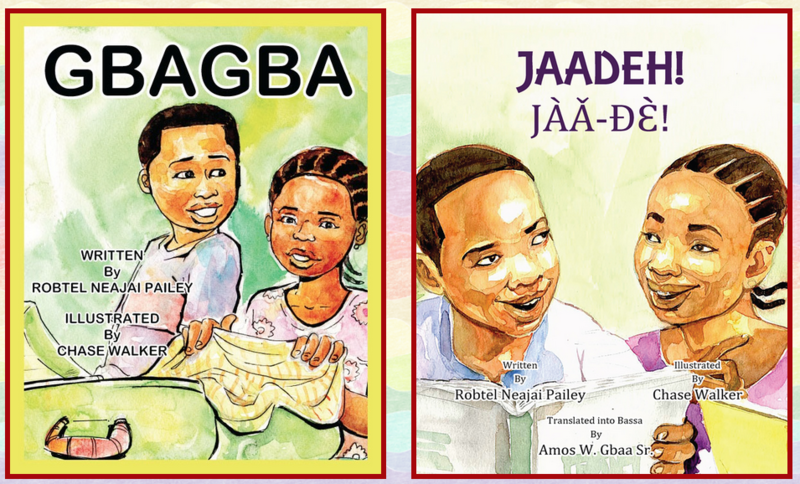 Presenter: ‘Gbagba and Jaadeh! as ‘Revolutions from Below’’, Malaysian Institute of Integrity (Integriti) Seminar on Anti-Corruption Champions: Sharing Session with the Winners of the 2018 International Anti-Corruption Excellence Awards (December 10, 2018), Kuala Lumpur, Malaysia. Discussant: ‘Building Collective Consciousness for the Fight against Corruption’, African Union (AU) and African Governance Architecture (AGA) sponsored 2018 High Level Dialogue on Democracy, Human Rights and Governance in Africa: Trends, Challenges, Prospects, Session Three (November 29, 2018), Gaborone, Botswana. Guest Speaker: ‘Experiences of Shifting Social Norms around Corruption: Gbagba and Jaadeh! as ‘Revolutions from Below’, U4 Anti-corruption Resource Centre Annual Seminar on ‘Social Norms and Anti-corruption’ (November 13, 2018), Copenhagen, Denmark. Presenter: ‘Post-party Politics? 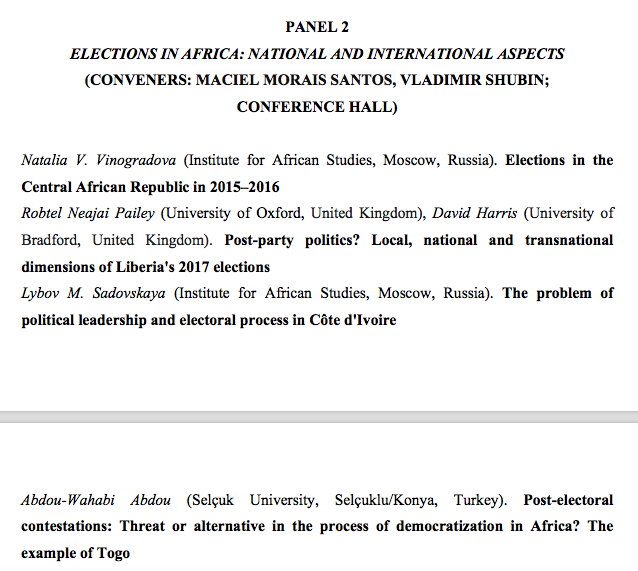 Local, National and Transnational Dimensions of Liberia’s 2017 Elections’, Institute for African Studies/Russian Academy of Sciences Elections in Africa Internal Changes and Foreign Policy of African Countries Conference Series, Panel 2 on ‘Elections in Africa: National and International Aspects’ (November 1, 2018), Moscow, Russia. 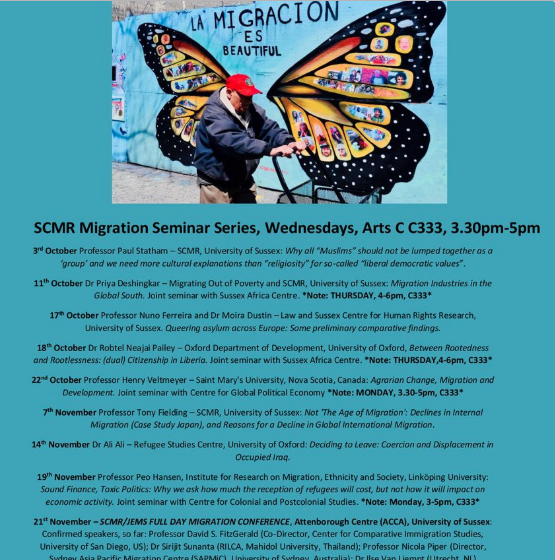 Presenter: ‘Between Rootedness and Rootlessness: (E)migration and (Dual) Citizenship in Liberia’, University of Sussex Africa Centre and Centre for Migration Research Joint Seminar (October 18, 2018), Brighton, UK. Co-presenter: ‘Post-party Politics, Forum Shopping and Liberia’s 2017 Elections’, University of Bradford John and Elnora Ferguson Centre for African Studies (JEFCAS) Seminar Series (October 3, 2018), Bradford, UK. Panellist: ‘Decolonisation and Social Media’ Roundtable, Nordic Africa Days 2018, African Mobilities (September 21, 2018), Uppsala, Sweden. ABSTRACT: Global academia, and African Studies in particular, is in the midst of a new wave of debates and interventions calling for the decolonisation of academic disciplines, school curricula and university structures. 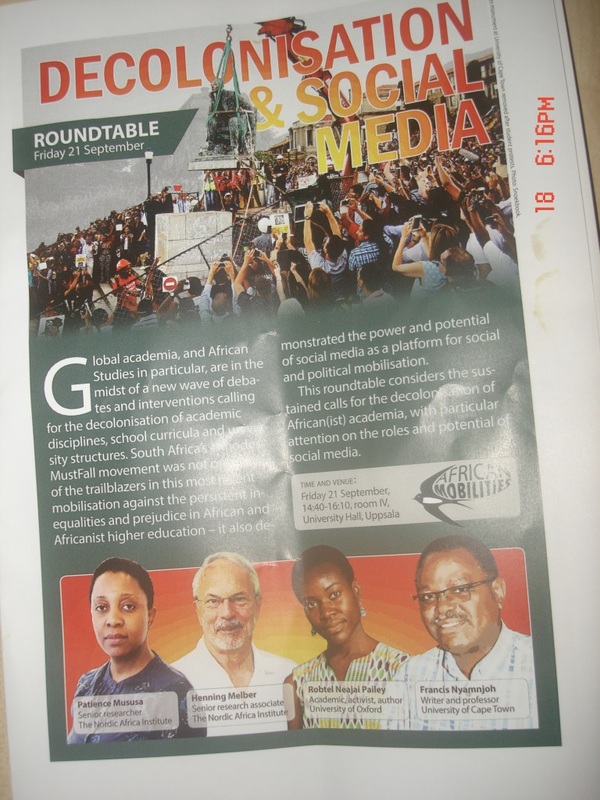 The South African “Rhodes Must Fall” movement was not only one of the trailblazers in this most recent mobilisation against the persistent inequalities and prejudice in African and Africanist higher education, it also demonstrated the power and potential of social media as a platform for social and political mobilisation. This Roundtable considers the escalating calls for the decolonisation of African(ist) academia with particular attention to the roles and potential of social media. 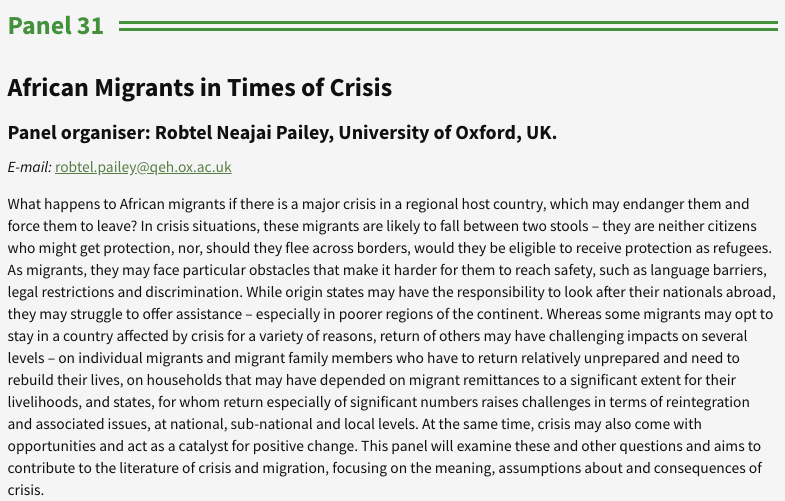 Panel Organiser and Moderator: Panel 31, Session I, on ‘African Migrants in Times of Crisis', Nordic Africa Days 2018, African Mobilities (September 20, 2018), Uppsala, Sweden. Participant: 'Where Is Africa Headed? Opportunities and Challenges for 2018', Royal African Society (RAS) High-Level Roundtable (September 12, 2018), London, UK. Co-presenter: 'Post-party Politics? Local, National and Transnational Dimensions of Liberia's 2017 Elections’, African Studies Association of the United Kingdom (ASAUK) 2018 Conference, Session OS9 on ‘State-making from Below' (September 12, 2018), Birmingham, UK. Moderator: ‘Representing Migration: Diversifying Voices and Audiences', Theme 7, UNESCO Regional Office for Southern Africa and the University of Wits’ African Centre for Migration and Society ‘International Conference on Migration: Southern Perspectives on Migration: Addressing Knowledge Production, Policies and Cooperation’, (September 6, 2018), Johannesburg, South Africa. Presenter: 'Libya Post-2011: The Consequences of Foreign Military Intervention in a Migration Hub', International Centre for Migration Policy Development (ICMPD) Libya Project, Academia Conference on Promoting Knowledge for Evidence-Based Sustainable Migration Governance in Libya: The Mediterranean Perspective, 1st Discussion Session on 'The Geo-political Context of Migration in Libya and in Its Neighbourhoods' (June 25, 2018), Tunis, Tunisia. ABSTRACT: Long before NATO’s military intervention in 2011 leading to the ouster of Muammar Gaddafi, Libya served as a major destination for intra-Africa migration. In the 1990s, it became a centre of revolutionary zeal and economic growth for sub-Saharan migrants, primarily due to its growing isolation from the West following the Lockerbie bombing over Scotland in 1988. On the one hand, Libya hosted and trained migrant mercenaries from countries such as Burkina Faso, Liberia and Sierra Leone in West Africa, thereby fuelling political crises in these locales and creating spillover migration effects regionally. On the other hand, Libya served as a pole of prosperity for labour migrants from Central African countries such as Chad, thereby creating remittance channels to stem household poverty in these locales. Gadaffi’s pro-Africa political stances (manifested in African guest worker programmes, visa exemptions for African nationals, etc), transformed Libya into a pan-Africanist haven. Desperate to realign with Europe in exchange for sanctions withdrawal in the early 2000s, however, Libya collaborated with Western countries in joint-border control measures to restrict the movement of Africans by subjecting them to harassment, physical assault, and arbitrary detention. This, coupled with post-2011 revolution violence and instability, has fuelled the so-called ‘migration crisis’ across the Mediterranean. This presentation will highlight how external military interventions in the internal political affairs of migration hubs such as Libya can create negative unintended consequences for domestic citizens, migrants and their families, regional neighbours, and international actors spearheading intervention efforts. It demonstrates how military interventions in countries of destination can ultimately reap disastrous results, especially if non-regional actors disregard the advice of regional institutions such as the African Union, which advocated for a more political solution to the domestic Libyan crisis. The presentation draws lessons from empirical data collected for the European Union-funded Migrants in Countries in Crisis (MICIC) research component examining crises in Libya, Côte d’Ivoire, and Central African Republic, amongst other case studies. 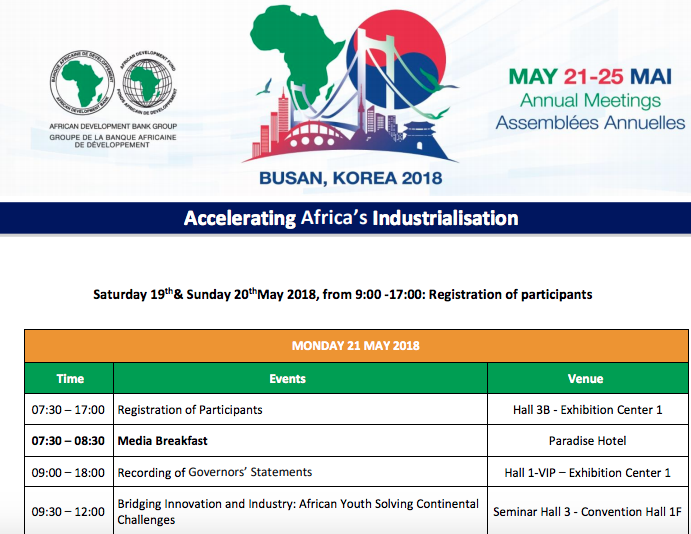 Facilitator and Co-organiser: 'Bridging Innovation and Industry: African Youth Solving Continental Challenges', 53rd African Development Bank Group Annual Meetings (May 21, 2018), Busan, Republic of Korea. 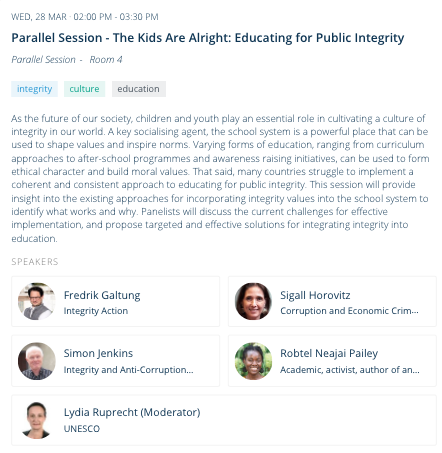 Panellist: 'The Kids Are Alright: Educating for Public Integrity', OECD Global Anti-Corruption and Integrity Forum (March 28, 2018), Paris, France. Panellist: 'Conversation on Gender Equality at the Bank', African Development Bank Group's International Women's Day Celebration (March 8, 2018), Abidjan, Côte d'Ivoire. 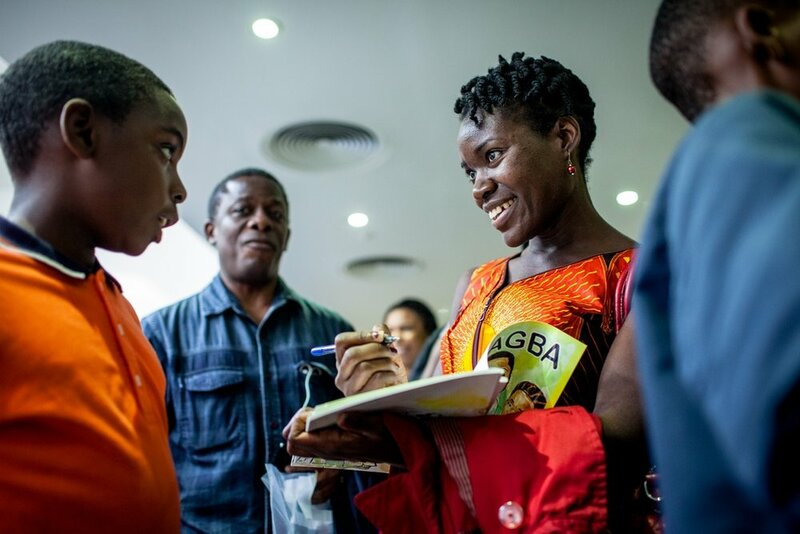 Workshop Facilitator: ‘Gbagba: A Lesson in Ethics, Integrity and Accountability.’ International Community School of Abidjan (February 2), Abidjan, Côte d’Ivoire. Guest Lecturer: 'From Lawlessness to the Rule of Law: A Critical Analysis of Liberia's Democratic Consolidation to Date', African Leadership Centre (December 8, 2017), Nairobi, Kenya. Panellist: 'Donor/Partner Roundtable with Fahamu', Fahamu, Networks for Social Justice 20th Anniversary Celebration (December 8, 2017), Nairobi, Kenya.